After almost nine years of claims and counterclaims, a ruling is finally expected soon in a lawsuit accusing Ringling Bros. and Barnum & Bailey Circus of abusing endangered Asian elephants. In March, U.S. District Judge Emmett Sullivan heard closing arguments in Washington in the case, in which Ringling Bros. asserted that it was a world leader in the humane treatment of elephants and argued that its methods of handling the animals — including the use of chains and sharp "bull hooks" — were allowed under federal regulations. "You can see our animals, they're in really great health," said Kenneth Feld, chief executive of Feld Entertainment Inc. of Vienna, Va., which produces the Ringling Bros. circus. For years, animal rights groups have alleged that the elephants in the Ringling Bros. and Barnum & Bailey Circus are mistreated. "I think they are very humane ways of handling them," he said in an interview with Today's Natalie Morales. Animal welfare groups, however, tell a very different story. Ringling Bros. "routinely" violates the Endangered Species Act of 1973 by "harming, harassing, and wounding endangered elephants," they allege, claiming that the circus' elephants are beaten, chained for long periods and forced to separate from their mothers at too young an age. "I call it daily, systematic abuse," said Tom Rider, who worked as an elephant barn man for Ringling Bros. from 1997 to 1999. Rider, of Washington, Ill., first brought the suit along with four animal welfare groups in 2000, claiming that Ringling Bros.' treatment of its elephants left him "aesthetically and emotionally injured." "It wasn't just one or two people," Rider told Morales. "It was every handler at Ringling that held a bull hook." 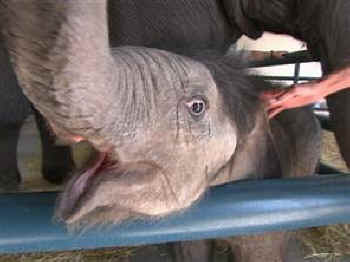 Ringling Bros. questions Rider's credibility. "Tom Rider claims he left Ringling Bros. because of elephant abuse, but he went with one of the very people he had accused of elephant abuse to Europe, so that's why his story is a bit suspect," said Michelle Pardo, an attorney for the circus. Feld Entertainment has produced the Ringling Bros. circus, long touted as "the Greatest Show on Earth," since 1967, when Irvin Feld, a famous promoter and publicist, bought what was then a struggling operation. Kenneth Feld, his son, took over when Feld died in 1984. Today, Feld Entertainment specializes in big, showy spectacles; in addition to the circus, it produces Disney on Ice and other live Disney extravaganzas, as well as Broadway events and the Las Vegas show of animal tamers Siegfried and Roy. The head of Ringling Bros.’ parent company contends the circus treats its elephants humanely. Feld contends not just that Ringling Bros. treats its Asian elephants humanely but that it is a world leader in preserving the species. The International Union for the Conservation of Nature and Natural Resources, a coalition of more than 1,000 government and research organizations, calculates that there are about 50,000 Asian elephants left in the world. In 1995, Feld opened the Center for Elephant Conservation on 200 acres in Lakeland in central Florida. The center cares for several dozen retired performing elephants and contributes to elephant breeding programs around the world. "We know that we can make a difference here, and we've proven it [by] having 22 births," Feld said. The most recent was a 250-pound male born on the eve of the presidential inauguration. It is, of course, named Barack. The bull hook — often known as an "ankus" but called a "guide" by Ringling Bros. — is at the center of many critics' complaints. It is routinely used by trainers both at the elephant center and in the circus show, and there is no attempt to hide it. Natalie Morales gets acquainted with Barack the baby elephant, a recent addition to Kenneth Feld’s Center for Elephant Preservation in Florida. "It's a tool that you use, that professionals use in a professional manner to control or ask anything of our elephants," said Trudy Williams, a handler at the elephant center. Williams acknowledged that "there's a point on it," but she said it doesn't pierce the animals' skin. "It's very superficial, like getting a mosquito bite or something," she said. But Rider, the former barn man who sued Ringling Bros., insisted that "if you [hold] a bull hook in your hand, you're hitting and hooking elephants." Rider, along with the American Society for the Prevention of Cruelty to Animals, the Animal Welfare Institute and the Fund for Animals, filed the lawsuit about a year after the death of Benjamin, a 4-year-old Asian elephant who drowned in a pond in Huntsville, Texas. In a video of the incident that was introduced in the case, Benjamin can be seen disregarding his trainer's commands to come out of the water. The trainer wades in with a bull hook, then is heard to exclaim, "Oh, God." Critics say the bull hook, a standard tool in handling elephants, harms the animals. An investigation by the U.S. Department of Agriculture (USDA), which monitors the care of performing animals under its Animal and Plant Health Inspection Service, initially found that the use of a bull hook "created behavioral stress and trauma which precipitated in the physical harm and ultimate death of the animal." After a review by the USDA General Counsel's Office, however, the final report concluded simply that Benjamin drowned after suffering cardiac arrhythmia "without any signs of distress or struggle." In fact, Feld said, Ringling Bros. and Feld Entertainment have "never been found in violation of the Animal Welfare Act." Strictly speaking, that is correct. Over dozens of routine inspections and investigations in the last 15 years, APHIS has never cited either organization for a "violation." But according to its records, APHIS has issued at least 10 citations or warnings since 1998 for what it calls "noncompliance," several of them alleging inadequate veterinary care. In 1998, the circus and the USDA settled federal allegations in the death of Kenny, a 3½-year-old Asian elephant. Kenny died of a gastrointestinal illness in January of that year after he performed his third show of the day in Jacksonville, Fla. The plaintiffs cited an internal USDA report that allegedly found that "orders from the attending veterinarian to leave Kenny in his stall during the 3rd performance on the day he died were not followed by the trainers." As part of the settlement, Ringling Bros. donated $20,000 to elephant-related causes, while the USDA issued a letter saying, "Ringling Bros. has never been adjudged to have violated the AWA or the Regulations and Standards issued thereunder." That letter, Ringling Bros. said, "reinforces the company's consistent position that it is dedicated to meeting or exceeding federal care standards for all its animals." The current lawsuit asks the judge to order the circus to provide greater protection for the elephants, as prescribed by the Endangered Species Act. Eric Glitzenstein, an attorney representing the ASPCA, said in an interview with Morales that he doesn't want to shut down Ringling Bros. Instead, he said, he simply wants "to make sure that something is done to improve the lives of these animals." The ASPCA "took a look at the evidence and concluded that the evidence was overwhelming that these animals, in fact, are suffering from conditions that they shouldn't be," Glitzenstein said.